Hello - I'm the founder of RaceMob. 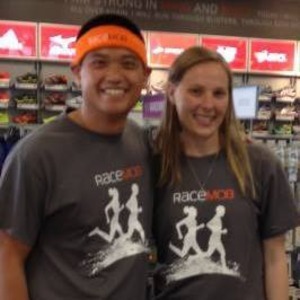 I started RaceMob in order to make race day more social. I thought that if there was a place you could find running friends, figure out which races people were going to, and have a way to meet up - we'd all have a better race day. I'm a first time entrepreneur, novice programmer, and newbie marketer. But I'm a quick learner, and I love building websites and defining great user experiences. If there's a feature you'd like to see or bug that's bugging you, don't hesitate to email me directly - or use the "feedback" button on the right. I'll respond as soon as I can. If you want to join me on this journey, want to bring RaceMob to your area, or want to partner up - please reach out. Let's grow RaceMob together! Like many of you - I wasn't born a runner. In fact, before 2010, I couldn't even go a mile. My dog Kiah was the whole reason I started. She is a mini-aussie with a motor that won't stop. In 2010, my New Years resolution was to take her on a walk every day. Well, the walk turned into a jog - and once we got started - Kiah never let me stop. Together we trained for my first marathon. We still run together - and she's still my motivation to never slow down. My first marathon was the Las Vegas Rock 'N Roll in 2010. I had been training the whole year for the event. When the day finally approached - I came down with a cold. Nothing that should have put me out of commission, but I (stupidly) took some Mucinex the day of the race. It completely dehydrated my body - and by mile 13, I was cramping and in severe pain. But I persisted the entire second half of the race, cramping, walking, crying... I finished nearly an hour over my goal pace of 3:30....but I was so proud of myself. To grow RaceMob into an awesome community that we can all be proud of. And to see RaceMobbers everywhere that I travel!